Jim Cornelison is in his fourth season as the Blackhawks’ full-time National Anthem singer, having made regular appearances singing the anthem at the United Center since 1996. Jim Cornelison sings the National Anthem to start off the scrimmage games at the 2011 Blackhawks Training Camp. Cornelison, a native of Vienna, Virginia, sang with numerous opera companies before coming to Chicago in 1995 to take part in the Lyric Opera’s Apprenticeship Program where he one of six accepted apprentices among more than 800 applicants. He has performed nationally and internationally with some of the biggest names in opera, such as Plácido Domingo and Zubin Mehta. Known as a heroic tenor for the dark color of his voice but ability to sing in a tenor range, he has sung with opera companies in Bordeaux, London, Brussels and San Francisco, among many others. A 1992 graduate of Indiana University’s Master’s of Music Program, Cornelison has received numerous accolades for his singing, including the William Matheus Sullivan Foundation Award and the George London Foundation Encouragement Grant, as well as first place in the American Opera Society of Chicago’s 1997 Vocal Competition. Jim has also sung the National Anthem at other Chicago Sporting events such as the 2011 9/11 tribute NFL game, Chicago Cubs games, Chicago White Sox game, Chicago Bears games, Chicago Bulls games, weddings and the 2009 Winter Classic game to name a few. The tradition of fans cheering and clapping during the National Anthem began at the old Chicago Stadium back in the 1985 Campbell Conference Finals. 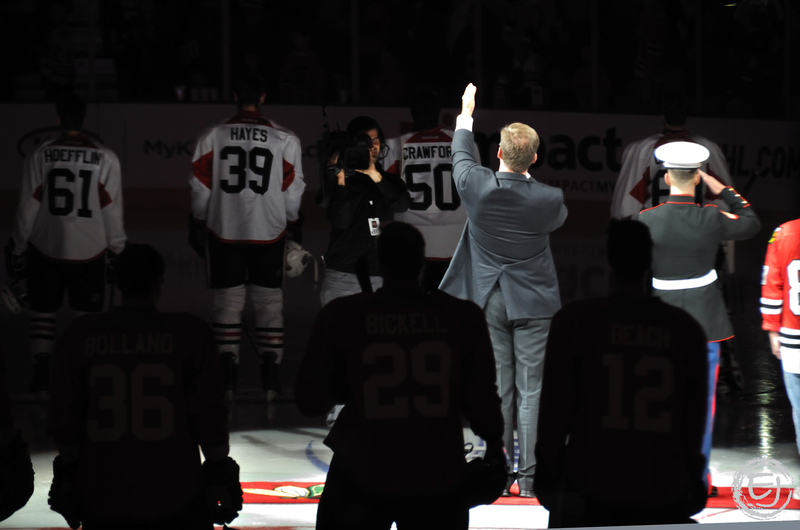 After the Blackhawks dropped Game 1 and 2 against the Edmonton Oilers on the road, the fans welcomed back their team with rousing cheers that lasted throughout the Anthem and Game 3. The tradition stuck. This entry was posted in Blackhawks, Chicago, Life, Sports and tagged Jim Cornelison, National Anthem, Star Spangled Banner. Bookmark the permalink.